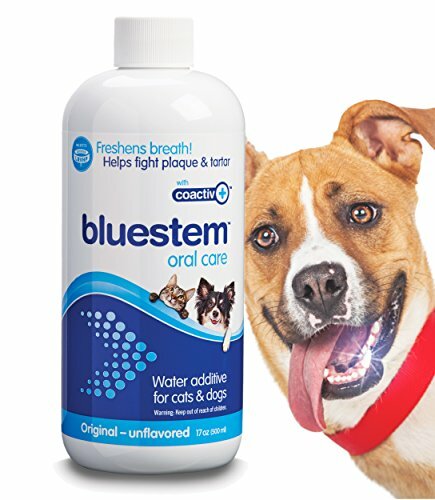 The bluestem oral care water additive with coactiv+ is scientifically formulated to freshen breath, help fight plaque and tartar, and promote good oral hygiene in cats and dogs. It's easy to use - just add 2 capfuls to 600ml of your pet's drinking water (1 capful is 10ml). Use it daily for best results. All breeds of cats and dogs can use bluestem oral care water additive. Contains coactiv+™ technology - a unique formulation of food-grade ingredients that are scientifically developed to break down biofilm, where harmful bacteria multiply. Clinically proven safe and effective for daily use in cats and dogs. The original “flavor” is flavorless. 【 ENJOY YOUR PET'S KISSES AGAIN 】 Although loving affection from your pet can be one of the joys in life, one with bad breath can ruin your day. By simply adding our breath freshener water additive to your pet's water, you can easily enjoy their kisses within just a few days. Kissing aside, did you know that the main indicator of dental problems is bad breath? Our water additive not only freshens breath but helps fight plaque and tartar as well. 【 SAFE FOR DOGS & CATS 】 Our water additive is safe for your pet. A safety study concluded that there was no evidence of adverse effects related to the consumption of the water additive*. Other additives on the market may contain unsafe ingredients. Our food-grade ingredients are alcohol-free, xylitol-free, chlorhexidine-free, and sugar-free. They DO NOT contain any surfactants or detergents, making our water additive safe for your pet no matter it's size. *Study summary available upon request.